Can you think of an input value that would output the following to the console? 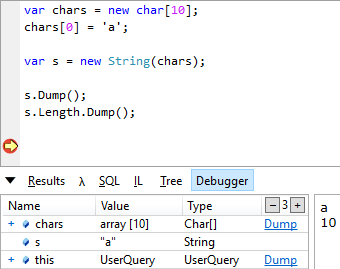 In the .NET Framework, a String object can include embedded null characters, which count as a part of the string's length. Null characters are ignored when performing culture-sensitive comparisons between two strings, including comparisons using the invariant culture. They are considered only for ordinal or case-insensitive ordinal comparisons. The above method treats first null character as string terminator and ignores all the remaining characters in the array. It will only trim trailing null characters. If the input character array had any null characters in the middle, they would remain in the resulting string. This might happen when the character array has been reused and contains old invalid data beyond the first null character. Since string are immutable, two strings will be created instead of one: the original one with the null characters and the final one without them. When creating a lot of strings this way, it will cause extera work for the garbage collector. That's where I did my first tests, when Goran brought this behavior to my attention.